Safe Assist offers businesses a safety director available when and where you need them. Our team of degreed and credentialed health and safety professionals offer hands-on experience in all aspects of safety management, including loss control, claims management, training and OSHA defense. We are highly experienced with on-site safety management of pharmaceutical, healthcare, chemical, manufacturing, aviation, power, solar and wind energy facilities as well as large-scale construction, hospital renovation, industrial retrofit and demolition projects. 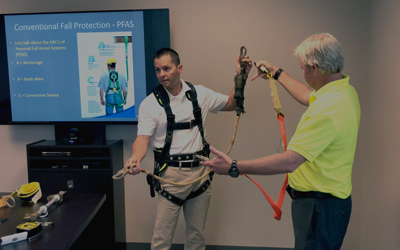 Effective safety programs foster a safety culture and elevate a team’s safety practices and its level of compliance with OSHA health and safety standards. Our Safe Assist program is ideal for businesses and organizations that care about the safety of their people and their bottom line. CORE is equipped to serve clients with construction, pipeline, power, manufacturing, shipping/receiving, warehouse, assembly, chemical processing, service, maintenance, laboratory, and healthcare operations located anywhere in the United States. Simply put, our safety professional becomes your organization’s safety director and is available when you need them. Perform site safety audits with written reports and trend analysis to monitor OSHA compliance and review for best practices. Prioritize safety during weekly meetings with our customized selection of “Toolbox Talks” addressing various safety best practices. Topical overviews will also be provided in electronic format for quick convenient access and sharing across your organization. Assist in mitigating and reducing the cost of OSHA and insurance claims. Develop a customized safety program and maintain updates for consistency with current OSHA policy and best management practices. Complete a thorough investigation from preliminary findings to post-investigation procedures should an accident occur. Coordination of substance abuse testing and results reporting for random, pre-employment, reasonable cause, and post-accident testing for drugs and alcohol. Utilize our vast selection of online safety training and instructor-led, on-site training courses to acquire the knowledge and certifications to ensure optimal safety at your site.